Abstract: A 62 year-old man relates his experiences after being diagnosed with an acrolentiginous melanoma on his foot. The surgery interferes with his plans to go on a father-son bear hunt. We hear and read many stories about the diagnosis and treatment of melanoma, but few relate what is important to the patient with the disease. My story begins a few years back when my son Scott, now 39, said to me “Dad, we need to go on a hunt.” It had been many years since we had been on a “hunt” together other than getting together in our home state of Vermont to stalk deer every November. In earlier years, Scott and I had hunted in Pennsylvania and New York, but after graduation from high school there was college, then marriage, and a family, leaving us little time for being able to go on a hunt together. I thought about what he said and when he brought it up again a few months later I knew he was serious. I acquiesced and asked what he wanted to hunt for and where? His immediate response was that he wanted to go on a bear hunt. This was something I had never considered. I’m pretty much a deer hunter, and in all my 50 plus years of hunting I had never even laid eyes on a bear in the wild. If that’s what he wanted to do, then I was up for it. 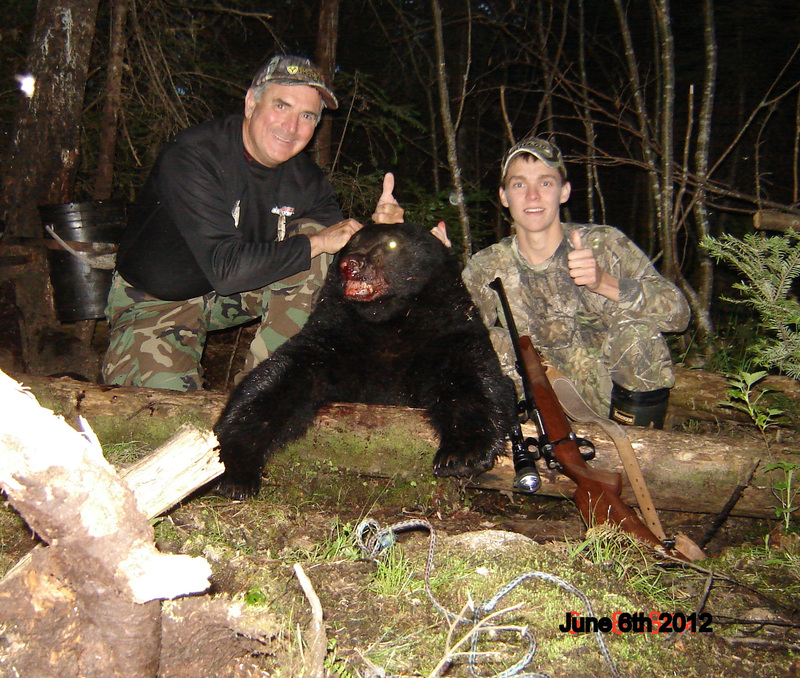 Since the Yankee Sportsman Classic in Essex Junction, Vermont was coming up in a couple of months we were going to wait until then and talk with a few outfitters about a bear hunt. I was particularly interested in talking with Glenn Dunning of Tundra Tour Consultants because a couple of my buddies had booked hunts through him, and they liked him and trusted in him. Besides, being a fellow Vermonter made talking with him all that more appealing. Scott and I attended the Classic in January of 2011, and as it ended up Glenn was the only one we needed to talk to. He had a few suggestions, but his top choice was Gerald Bonneau, an outfitter with Roberval Trophy Bear on the shores of Lake Saint Jean in central Quebec. 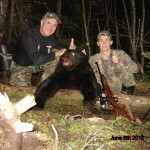 Scott and I booked our hunt that day for a June bear hunt that same year. We left the show excited and happy with how Glenn laid it all out for us as well as his enthusiasm for us as a father/son getting together for a great time. We were going on a bear hunt! A few months later as fate would have it, my anticipation of the upcoming hunt was dashed by one word: CANCER! In early April, I was diagnosed with Stage 2 melanoma from a spot on the bottom of my foot that had suddenly become swollen. My visit to the podiatrist and a biopsy showed it was melanoma and it was a very thick tumor. In early May, I had the tumor removed, which required a skin graft and a sentinel lymph node biopsy taken from my groin to see if the cancer had spread from the tumor of my foot. When I first looked at my foot and saw how much they had to remove to get it all, the only thing I could think was I would never walk again. As it turned out that was the least of my worries. The sentinel node biopsy showed that the cancer had spread to my lymph nodes. On May 16, 2011, I had another surgery to remove all of of the lymph nodes in my groin, and 3 of the 5 nodes removed were cancerous. Now I was a Stage 3 Melanoma person. A few days after surgery things only got worse as I developed an infection in my groin. I had already talked with my son and the guide, Glenn, about my situation, but I was still in hopes of making this hunt, especially not knowing at this point if there would be another chance to have this “special” time with my son. Once the infection hit I knew I wasn’t going to make it. I spent several days on IV antibiotics, and was sent home with some oral antibiotics. Two days later the fever came back and I was back in the hospital for more IV antibiotics. Finally, I was released on Memorial Day as the infection was under control. This was nine days before the hunt, but it was already a foregone conclusion that we were not going bear hunting that year. My next concern other than my future health issues was what happens now. The expensive hunt was paid for in full and we had no cancellation insurance. I talked again with the Glenn Dunning and he assured me that he would do whatever he could, but he needed to talk with the outfitter first. A couple of days later Glenn called and told me that the outfitter would postpone our hunt for a year, and it was completely paid for even if there was a price increase. Glenn assured me that the main thing was to get better and he removed all my worries about the hunt. Wow! What a relief and what a restoration in my belief in human kindness! I was now more motivated than ever to have that special time with my son. With a lot of prayers and hard work, and a whole lot of waiting for June of 2012 to arrive, the hunt was on. On June 3rd, 2012 my son and I made the 10 hour drive to Roberval for the hunt. The first night we both encountered a couple of small bears, but nothing worth harvesting. On the second night the moment I had prayed for came. That moment was the look on my son’s face when my guide and I went to pick him up. I knew the second I saw him that he had taken a bear, and what a great bear it was, weighing well over 300 pounds with a beautiful white V on its chest. There were a lot of high 5’s and hugs, and a great sense for me of mission accomplished. Things got even better for us the next night when I harvested a good mature 200 plus pound bear. We had done it! What a great hunt, and a great time, and a lifetime of memories. Everything I had endured made this moment all so much sweeter. There are no guarantees in hunting, and I know, all too well, there are no guarantees in life. The only sureties we have are the memories we create. With God’s help, and with the kindness and generosity of our guide, Glenn Dunning, and the outfitter, Gerald Bonneau, the memories my son, Scott, and I have of this special hunt will forever endure! This entry was posted in Guetti, Tim and tagged acrolentiginous, bear, father, foot, hunting, melanoma, son, surgery by humanemedicine. Bookmark the permalink.